I’ve been obsessed over finding the perfect pair of peep toe booties since I first saw a pair on a stylish gal who was walking by when I was downtown a few years ago. When I saw this pair by Xappeal at Rack Room Shoes, I knew they were it. 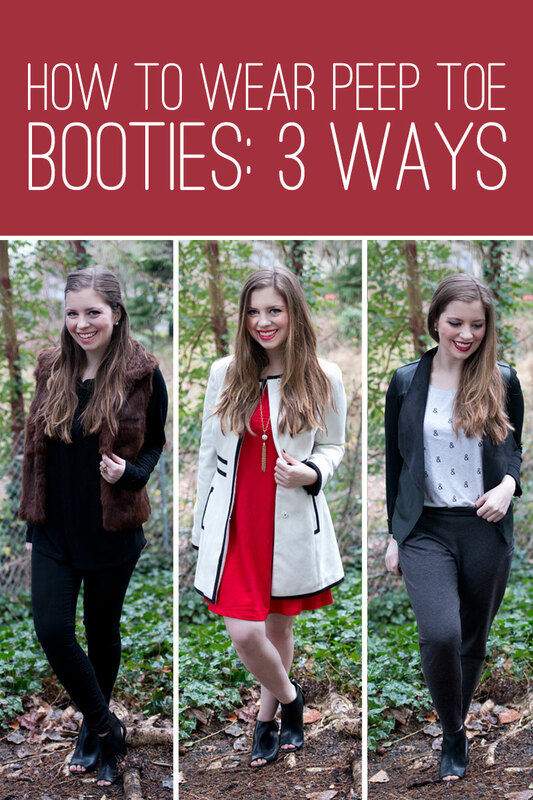 Since I know these are a bit different from your standard pair of ankle boots, I thought I’d share how to wear peep toe booties in 3 different, winter-friendly ways today! Okay, I’m being brave and bearing my legs… then again it is about 50 degrees here. I think you could totally make this work if you’re in an even colder climate than mine by adding a fun colored tight. I’m usually not the biggest fan of peep toes and tights, but I think with the right tight it could definitely be a fun look! On the weekend, I like to dress much more casual. I think a nice pair of knit track pants dressed up with these booties is a fun look, and I like the touch of leather in the blazer, on the waist of the track pants, and in the bootie. I think a sweater and vest combo is perfect – it’s nice and warm up top, so if your feet get a little bit chilly your upper body can compensate. Obviously if it’s a blizzard, I wouldn’t recommend this outfit, but if you’re from a climate like mine (hi rain!) open toes are still do-able. Disclosure: Rack Room Shoes sent me these booties for review and styling, but no further compensation was received. All opinions are my own. And if you’re still looking for your perfect pair of peep toe booties (or any other winter-friendly footwear!) Rack Room Shoes offers tons of great on-trend footwear and everyday “Buy One Get One 50% Off” promotion on all styles. Plus, sign up for the Rack Room Rewards® and get member’s only perks include exclusive discounts, coupons, and $15 in rewards for every $200 spent. Deals deals deals! And with that, I hope some of these outfits will help you plan your dressing around the holidays! I seriously cannot believe Christmas is 2 days away. I need to get to wrapping! Would you rock a peep toe bootie in winter? Those looks are all adorable + I LOVE that cream + black coat. Happy Holidays! Thanks Tanya! I have tons of ankle boots too, these were my first peep toe bootie and am loving them! 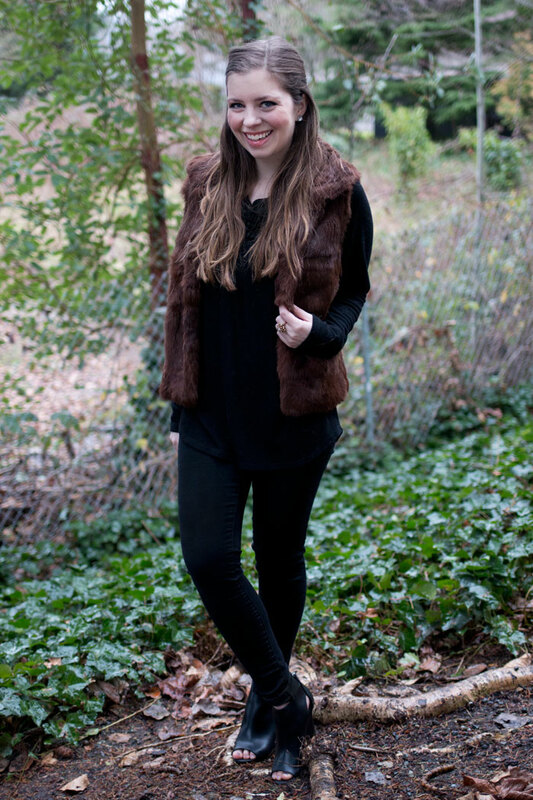 So cute, I love the outift with the fur vest! Such a great winter look! I don’t think I’ve ever seen peep toe booties before. They are really cute! I love that you can wear them lots of different ways. While you look absolutely adorable, I don’t think there’s anyway I could manage these. I am that person who freezes in 60 degree weather, and my feet are basically blocks of ice from November to April, even with the three pairs of socks I wear! I love these outfits, I think the vest is my fave! Awesome outfits, my favorite is the first one! I love the coat and the red dress. I don’t think I could rock the peep toe shoes in the winter time. I don’t really rock the peep toe in summer either. But they look so cute on you. super cute! i like them all, especially the red dress and the vest! I always love the way these look on other people but when I put them on my own foot, it just looks off! So weird! You can totally rock them though so congrats on that! I’m jealous! Haha! I know what you mean, I feel that way about certain style trends as well. Thanks Kate! You rock those boots really well! I am definitely not brave enough to wear them. I could see myself wearing them to a party, but I don’t think I’ve been to a party where those would have been appropriate in awhile. love my booties…i wish i could transition the peep toes into winter in chicago. Love the look on you but don’t think I would do the bare legs these days – too cold! I can’t blame ya – we just hit another cold streak so I won’t be wearing them for awhile either! I’m just grateful you’re not wearing rights with any of them. I cannot stand tights with open/peep toe shoes and would probably have to unfollow you! Haha! I know what you mean. I have never done it, but I’ve seen others wear it and it especially makes me cringe when you see the tight seam in the toe area! your outfits look great!! :) are you still using the trigger remote? i really love your coat in the first picture! I love your outfits they are adorable! Hope you are having a lovely Holiday! I love that white coat, so pretty! Thanks Myrabev! Happy holidays to you as well! Wearing them with patterened tights sounds fun! I’ll have to expermiment with that. I have wider feet as well and like you, find peep toes are much more comfy! Thanks Katie! I can imagine peep toes are not appropriate for most climates this time of year ;) Love how you styled yours – the zippers on the front of yours are so edgy! I love all of these outfits! I wish I could wear peep toes right now but my toes would fall off! Yes I love peep toe booties and I wear them as long as there is no snow/ice on the ground and its over 30F. Weather permitting. Totally agree, Tammy! Definitely not worth it to wear peep toe booties in the cold!